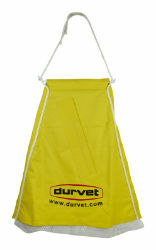 A durable, easy-to-load dust bag featuring a unique flicker chamber that recharges with dust as dust bag drops off hindquarters of animal passing under it and facilitates correct dosage and proper application. Also has convenient 2-point attachment for convenient and easy hanging. A steel spreader bar allows for two point attachment and assures that bag will not turn sideways in the lane. Weather proof loading vent - no flaps or covers. Choice of insecticide. Versatile - can be used for either free choice or forced use applications. For free choice conditions, one bag will handle 25-50 head.